We’ve had a love affair with Zuke’s since before they had any idea who we were and we are proud to have them as one of our long-term sponsors. Their continued support helps to make sure we have the treats we need to fuel our adventures and that I can continue to share our stories and tips. 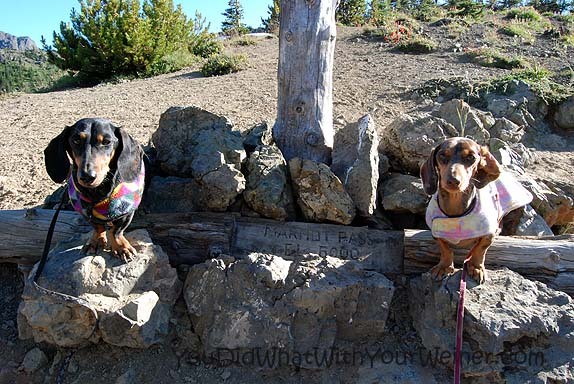 In a perfect world, I would be able to head out on a hike with Chester and Gretel and come back when whenever we feel like it. That us not the reality though. 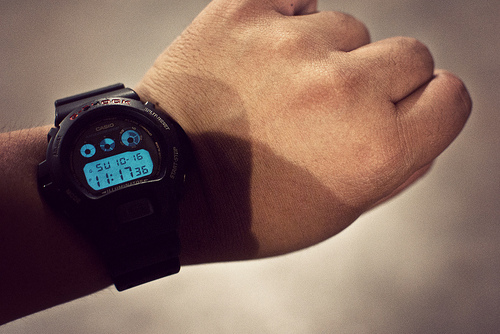 You have to consider time when you are planning your hike. On a day hike you are constrained, at a minimum, by daylight hours. Sometimes there are “life” constraints. Last week when I went hiking with the Adventureweiner Club I had to be to work later that day. When you go on an overnight backpacking trip you have to time it just right so you end up in a designated campsite when you are tired or it gets dark. Back in my early days of discovering the wilderness and working for a National Park, I read a lot of books on trip planning. I don’t remember the books now but I do remember some of the very important things I learned. Many miles of trail later I take a lot of it for granted but I know that there are some people just getting into hiking that may not know. One of these things is estimating time when you are hiking. One part of the equation is your hiking speed. You can geek out on the details discussed in point three of this PeakMind blog post but the general rule is 3 miles per hour. If the trail is steeper, or you are out of shape, you need to add a little time to that. If you are in great shape, the trail is flat or you are hiking downhill you can subtract some time off of that. I would say adding or subtracting 30 minutes would do the trick. You need to know how many miles it is to your destination. In the case of a day hike, that destination is usually the trailhead because ultimately you will end up back there. In the case of a multiple day hike you may have mulltiple destination options. In that case you would look at a trail map to determine where the campsites are located along the trail. Each of these could be a potential stopping point. You will also need to know how many daylight hours of hiking you will have. There are a few ways you can manage your time based on whether you are going for a day hike or a multiple-day backpack trip. The first method is ok if you know you have enough time and you just want a general estimate of when you will back to the car. In this case, all you have to do is divide the length of the hike by your hiking speed. For example, I went on a 6 mile round trip hike (trailhead, to lake, back to trailhead) the other day and estimated that it would take me 2 hours at 3 mph. The method I use to figure out when I need to start my hike, and make it out by dark, is the “work backwards” method. I determine what time I would need to be back at the trailhead. I divide the trail distance by my hiking speed. I subtract the result from the time I need to be done with the hike and don’t start any later than that. For example, say I have to be out of the woods by 4 pm. I know the trail is 4 miles round trip and I will be hiking about 2 miles per hour. Four divided by 2 mph is 2 hours so I subtract the estimated 2 hours from 4 pm to get a start time of 2 pm. I always like to add in another 30 minutes just to be safe so I would make sure I have started my hike by 130 pm. If you are going on an overnight hike, consider your start time and then when it will get dark or you will bet tired. Multiply those hours by your speed. That will tell you the maximum distance you will be able to hike that day. Look at your map and find the marked camp sites that are within your time window. That will be your stopping point for the day. For example, I am starting the hike at 8 am and I know it get’s dark (or I will be tired) by 2 pm. That means I have 6 hours of hiking. I know that I will be hiking an average of 2 mph. Since I take out an hour of time for breaks, I would multiply 5 hours by 2 mph and know that I can cover a distance of 10 miles. On my map there is a campsite at 8 miles and 12 miles so I pick the one at 10 miles to camp at. Hiking ability of people you are hiking with – are you going to have to hike at a slower pace or take more breaks? How crowded the trail is – will you spend some time stopping to let people pass or hiking behind a slower party? Your dog’s speed – Does your dog hike at your speed or is it slower? Terrain – really rough terrain, a steep trail or obstacles such as big rocks or downed trees can slow you down. What are you carrying – If you are carrying a large, overnight backpack you will be hiking slower than normal. Add time accordingly based on those things. If any of those things might slow me down, I add another hour or two to my time depending on how long the hike is. No matter what, you should always carry a flashlight or headlamp in case you DO get stuck out after dark. Be safe out there. Good advice. Especially since it gets so dark early these days. We haven’t been hiking in a few weeks but I’m hoping we can make it next week. Do you hike when it rains? Sound advice! We always build extra time into our hikes. In fact, we’re always super-conservative, because one can always use some extra time on the trail to enjoy the view, take a nap, and check out all the pee spots. Regarding the list of things that may make your hike longer than you think, I suggest adding “how many critters your dog is going to be interested in”. When we hike at high elevation, marmots drive me insane. Sometimes my parents need to carry me because I start pulling in all directions and our average speed drops below 0 mph because we start going backwards. I also need extra time to eat crickets, which I discovered this past summer. Yeah, I start with this calculation but am conservative too. I usually ad at least an hour onto the calculated time to be sure we don’t have to rush. 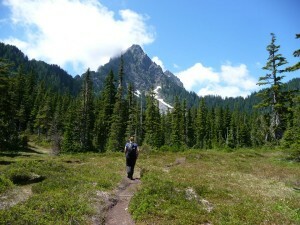 I took my new-to-hiking hubby on a multi-day backpacking trip when we first started dating. One thing I didn’t account for was him. He WAY overstuffed his pack despite my warnings (it was heavy). I planned the daily hiking time and added and hour but we still had to hike an hour in the dark! He needed several more breaks than I anticipated. Good advice. We have never been stuck out after dark. We have had super long walks because we got lost but always found our way before dark. The worst I ever heard was when Mom and Katie were training in Germany, running eight miles on the beach and the fog came in. This is something that happens so fast you really don’t know until it is too late. Several times a year the rescue team has to go out and save people. They couldn’t find their way back to the land. Mind you the beach there at tide out is almost a mile wide and six miles long. I guess Mom was pretty scared and not sure if she could trust Katie to get them back but after running a few extra miles they made it. Later in the day Mom remembered her running watch had a compass on it, but having never used that feature and being a bit panicked, she never thought of it. Fog is a scary and dangerous thing. I know what you mean about fog. It can roll in really quick here in the mountains and every year at least one person gets lost or dies from falling off a cliff they didn’t know was there. Scary. Once in college, a friend visited from Georgia. I took him hiking. I thought he had been before but I know he hadn’t hiked mountains like ours. I had my back turned and he wandered off into the thick fog by himself. I panicked – running around calling his name. After 30 minutes or so I contemplated leaving him a sign in the trail and hiking back out for help. THEN he wandered out of the fog. I was so angry! He said, “what is the big deal, I was just strolling around while you were taking a break”. For 30 minutes by himself! Can you believe that? He didn’t even say anything to be before disappearing! I tried to explain the danger of fog to him but he just didn’t get it. Ugh! Glad you found it helpful. It can feel common sense – I mean you probably do similar calculations when running the kids and dogs around – but people new to hiking don’t always think of applying the same principal in the woods. More than once e have had to speed march out of a place to get back before dark. We tend to dawdle sometimes, and that certainly adds on time. Good advice for everyone. I don’t think I have every had to do a speed march out of the woods to beat the dark but I have needed to practically run out to make an important appointment. Out is always downhill, and with my bad knees, it is so stressful and painful 🙁 I will say, that I was pressured by someone else to keep going a little longer before we turned around. My gut knew we needed to turn around sooner. Lesson learned….or re-remembered. I know one thing I didn’t include on the list! Pictures. My hubby and I both like to take a lot of pictures. Sometimes it feels like we are going at a snails pace because we keep stopping. Being stuck in the wilderness at night with small dogs is one of my nightmares. We let everyone know if we aren’t back by light to call out the national guard. I wouldn’t want to be stuck in the wilderness at all but I carry enough crap that I know we could survive at least one night. I see having little dogs with me as a bonus because we can all snuggle together to keep warm 🙂 I admit I have gotten complacent about letting people know I am out for a hike though. If I go without my hubby, he always knows where we are going and about when to expect me. However, usually we are out together and, now that I think of it, we don’t tell anyone else we are out. I guess I get lazy about it because they day-hikes are so well-defined and crowded around here. I shouldn’t be though. I know that something unexpected could happen anytime. Thanks for the reminder. Man alive. I haven’t been hiking in forever. I’m afraid someone might have to carry me if I went hiking now. Excellent tips. I imagine stopping to look at something interesting or take pictures would also add time. In San Francisco you have the fog to deal with too…which is way more unpredictable than daylight. Great tips, especially to bring a flashlight, just in case. We don’t even like the semi-dark in our neighborhood, so the dark in the woods would be terrifying. Honestly, I’ve never gone hiking before. I’m probably the least physical person on earth. What we do in our free time is work on our balls skills… where they ran after the ball and I follow behind to pick it up since when it stops, they all just stare at it. Great hiking tips, by the way. I love the one hour addition for things that keep can potentially slow down the hiking schedule.